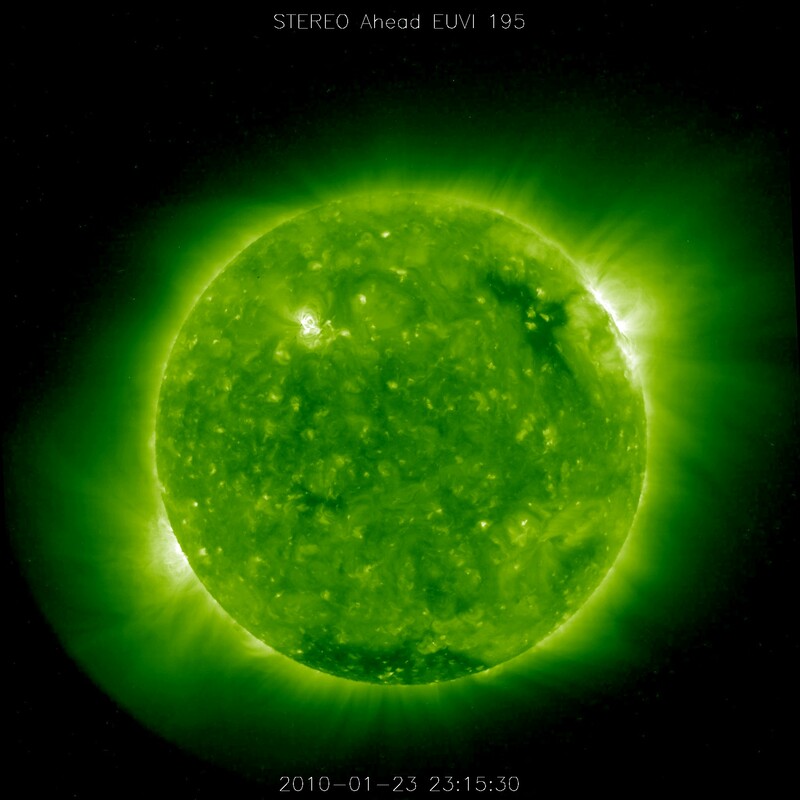 Figure A sets out a NASA Stereo image of the Sun on January 23, 2010. The video below (4mins. 50 sec.) analyzes similar NASA Stereo spacecraft images of the Sun taken on January 21, 2010, and highlights the UFOs around the Sun. It is recommended that readers watch this video to fully view the giant UFOs. (Dr.) Joseph B. Gurman, NASA STEREO Project Scientist responded to the images of giant UFOs near the Sun with the following technical explanation (reported January 21, 2010). Dr. Gurman wrote, ìWhat you're seeing is the difference between "beacon mode" (near real-time, heavily compressed, binned [I believe 512 x 512 or smaller]) images and normal playback telemetry images (2048 x 2048 native mode, less heavily but still lossily compressed). "On January 18, at 21:47 UT, the 'central data recorder' at DSN, that stores all the playback data from all the missions DSN supports, failed. A backup CDR took over, but apparently started working on data from January 10, instead of just the four previous hours, as designed. (The last I heard, the DSN engineers don't understand why, but it certainly sounds like a software issue.) For some reason, DSN is unable to reset a pointer and say, please start processing from this time instead of that time. So we, and all the other missions supported by DSN, are waiting for our playback data from January 18 and all following days. As soon as we get it, and the instrument teams have reformatted the telemetry into scientifically useful formats (that allow, for instance, making SECCHI EUVI data into images), we will post the images and other STEREO browse data in the normal places. And no, I don't know why DSN designed such an inflexible CDR system. I suspect they may modify it after this experience." The recipient of Dr. Gurman’s letter did not find NASA’s explanation credible. Giant, Earth-sized UFOs have appeared before around the Sun and have been monitored and recorded by NASA’s Stereo spacecraft. The present “giant solar UFO wave” which commenced on January 18, 2010 is the most recent of a recurring phenomenon. Physicist Nassim Haramein may have successfully explained giant solar UFOs in terms of quantum physics and singularity theory. In the following video extract from one of his lectures, using the example of a prior giant solar UFO wave recorded by NASA Stereo spacecraft. According to Mr. Haramein, every Sun contains a black hole singularity. Advanced extraterrestrial or interdimensional civilizations wishing to access our solar system with large (Earth-sized) spacecraft can do so through the star gate of our Sun. What are the implications for 2010 ET disclosure of giant solar UFOs? The January 18, 2010 wave of giant solar UFOs has profound implications for 2010 extraterrestrial disclosure, assuming original NASA’s Stereo space data are true images. 1. NASA cannot be trusted to perform extraterrestrial disclosure – The technical explanation of equipment failure offered by Dr. Joe Gurman, NASA Stereo Project scientist is implausible. Without just cause, NASA removed images which showed giant solar UFOs from its website. 2. Progressive human science now can explain giant solar UFOs – Nassim Haramein’s singularity theory offers a plausible, science-based explanation of giant solar UFOs, which use the star gate of our Sun to access our solar system from interdimensional reality. 3. The January 18, 2010 solar UFO wave constitutes a disclosure of their presence by extraterrestrials – By entering our solar system through the Sun’s star gate and being monitored and recorded by NASA’s Stereo spacecraft, extraterrestrial (interdimensional) civilizations have de facto disclosed their presence in space ships as large as the Earth. Diese Fotos stammen vom Nasa Soho Stereohead Ahead Sattelit, der die Bilder am 3 Februar 2010 gemacht hat. Wieder befinden sich runde Bälle in der Nähe der Sonne. Die Sechs Bälle benutzen wahrscheinlich ein Wurmloch, was uns der Eintrittswinkel zeigt (19,47 Breitengrad). Siehe hierzu das Video auf dieser Themenseite.